The solid steel frame of the HSC series Stamping Press is designed to withstand Stamping thick gauge metals and process drawing operations. The H frame construction ensures stability, accuracy and reliability. Wet or dry clutches can be fitted and all drive gears are precision ground. An overload protection system is fitted to all presses. Capacity ranges from 100 to 600 Tons. 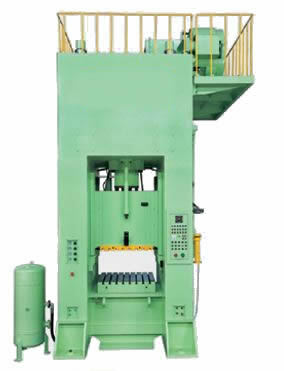 The solid steel frame of the HDC series Stamping Press is designed to withstand Stamping thick gauge metals and run progressive dies, due to the large bolster area. The H frame construction ensures stability, accuracy and reliability. Wet or dry clutches can be fitted and all drive gears are precision ground. An overload protection system is fitted to all presses. Capacity ranges from 200 to 600 Tons. 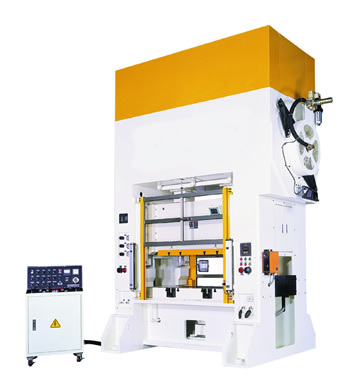 The solid steel frame of the HDC6G series Stamping Press is designed to be a very cost effective solution when comparing a Straight Side, H frame or an Open Back C frame Press. 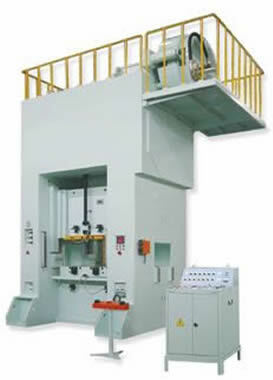 The HDC6G series Metal Stamping Press is similar to a Straight Side Press when stability is required. By fitting a 6 Gib slide you get the functionality similar to the combination of a real Straight Side type Press with the added advantage of a large bolster area, similar to an Open Back C frame Press and at a lower cost. 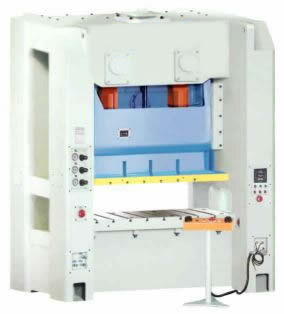 This HDC6G series has become popular with modern day Metal Stampers. 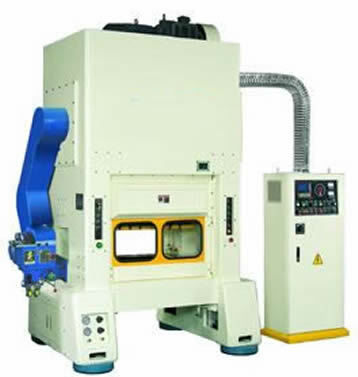 Capacity ranges from 160 to 300 Tons. The solid steel frame of the HDC8G series Stamping Press is designed to be a very cost effective solution when comparing a Straight Side, H frame or an Open Back C frame Press. 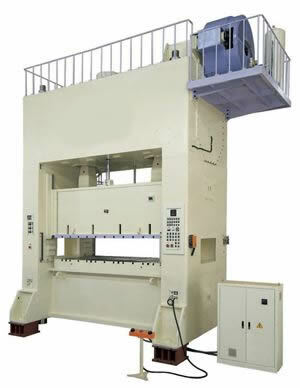 The HDC8G series Metal Stamping Press is similar to a Straight Side Press when stability is required. By fitting a 8 Gib slide you get the functionality similar to the combination of a real Straight Side type Press with the added advantage of a large bolster area, similar to an Open Back C frame Press and at a lower cost. 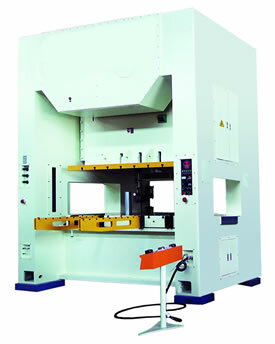 This HDC8G series has become popular with modern day Metal Stampers. The Link Motion Press has a link crank mechanism that reduces the downward speed of the ram near Bottom Dead Centre (BDC) and then accelerates after BDC to Top Dead Centre (TDC). This reduces impact shock, vibration and noise, while providing the same overall cycle speed as compared to a conventional Mechanical Press. Capacity ranges from 110 to 400 Tons. The solid steel frame of the HSCHS series High Speed Stamping Press is designed to minimise deflection, ensure accuracy and reliability with its rigid structured frame. An overload protection system is fitted to all presses. However, in the occurrence of die jamming, this press has an easy hydraulic ram release system. Capacity ranges from 60 to 200 Tons. 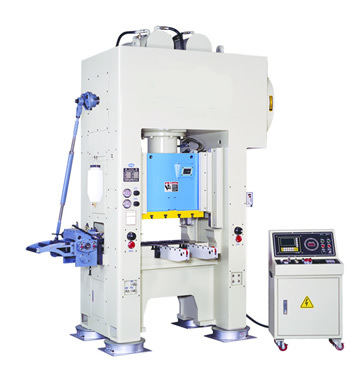 The solid steel frame of the HDCHS40200 series High Speed Stamping Press is designed to minimise deflection, ensure accuracy and reliability with its rigid structured frame. An overload protection system is fitted to all presses. However, in the occurrence of die jamming, this press has an easy hydraulic ram release system. Capacity ranges from 40 to 200 Tons. 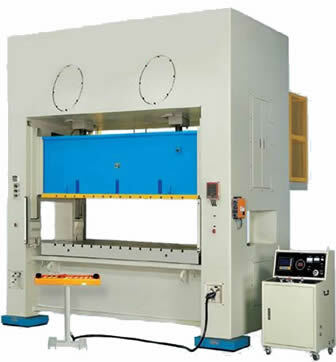 The solid steel frame of the HDCHS60300 series High Speed Stamping Press is designed to minimise deflection, ensure accuracy and reliability with its rigid structured frame. An overload protection system is fitted to all presses. However, in the occurrence of die jamming, this press has an easy hydraulic ram release system. Capacity ranges from 60 to 300 Tons.